The Irchester Scouts, under Scoutmaster C Payne and Assistant Scoutmaster G Wilkins, were entertained to tea at “The Ferns” on Saturday, by the kindness of their president, Dr Gabb, and Mrs Gabb. 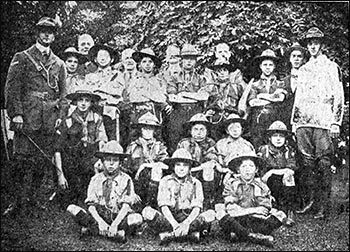 In the afternoon the Scouts were inspected by the committee, and then gave an exhibition of drill, ambulance, signalling, and scouting games. After tea, which was held on the lawn, Dr Gabb presented the Scoutmaster’s Warrant to Mr C Payne, and in a few remarks urged the boys to stick to their Scouting, and Scoutmaster, Mr Payne suitably replied. Games and competitions were indulged in, and Mr F Wootton gave a few selections on his dulcephone. At 8.30 cheers were called for Dr and Mrs Gabb, the committee, and Scoutmasters, and the singing of the National Anthem brought to an end what had been a most enjoyable time. About a dozen of the boys are camping in Hunstanton during Bank Holiday Week with their Scoutmasters, and although the troop has only been re-formed three months they have provided themselves with their full equipment and can already give a good account of themselves as Scouts.